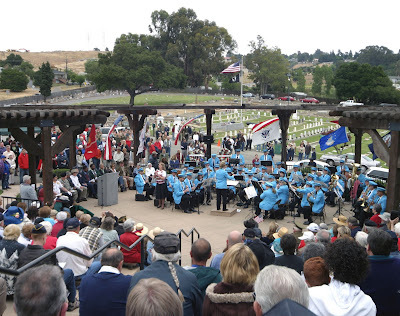 The 2009 Memorial Day Program at Hayward's Lone Tree Cemetery starts at 11:00 a.m. on Monday, May 25, 2009. This will be the 106th annual celebration honoring our heroic men and women who died so the United States of America might live. The program is presented by the Allied Veterans Cemetery Committee and Lone Tree Cemetery. Alan Strutz, who has been involved in presenting the Hayward observance for 56 years, will attend. 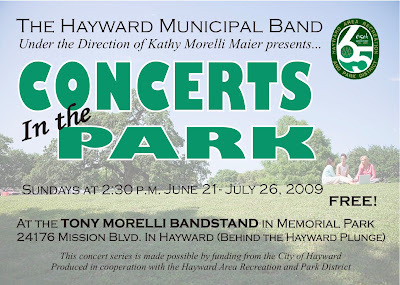 The Hayward Municipal Band will begin playing at 10:15 a.m. in the amphitheater. In addition to the music, the program will include presentations by City of Hayward and Alameda County elected officials, a flyover by F-16 fighter jets, tours of a Vietnam-era Huey helicopter, and participation by Military Service Organizations. A free community barbecue will be served by Lone Tree Cemetery and local Scout Troops after the program. The Hayward Municipal Band hopes to appear at the annual Memorial Day event at Hayward's Lone Tree Cemetery. Details will be provided soon. Here is a photo from the 2008 performance, which you may click for a larger view. Photo courtesy of Tom Carroll. The Band's 2009 program runs from June 21 through July 26.